Today: a Swiss pencil, the Caran d’Ache edelweiss. The edelweiss is, as far as I know, Caran d’Ache’s cheapest full-length pen1. By the way, Edelweiss is not only the English but also the Swiss spelling of Edelweiß because unlike in Germany and Austria the ß is not used in Switzerland. 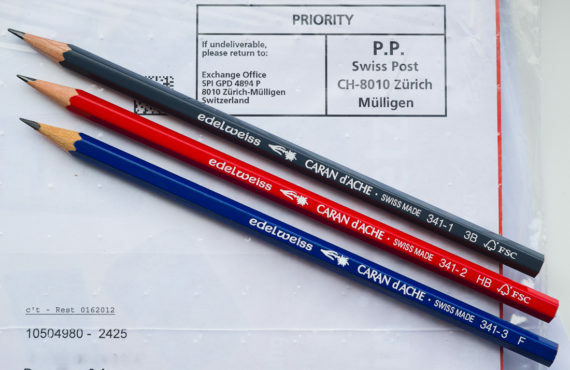 Outside Switzerland, Caran d’Ache is mainly known for their luxury writing instruments, but they also sell what I would call “office supply priced” stationery. I paid € 0.60 (~ $0.78; £0.48) each for the edelweiss pencils. Their other “office supply priced” stationery includes ballpoint pens which start at just under CHF 2 (~ $2.15; €1.65; £1.30). 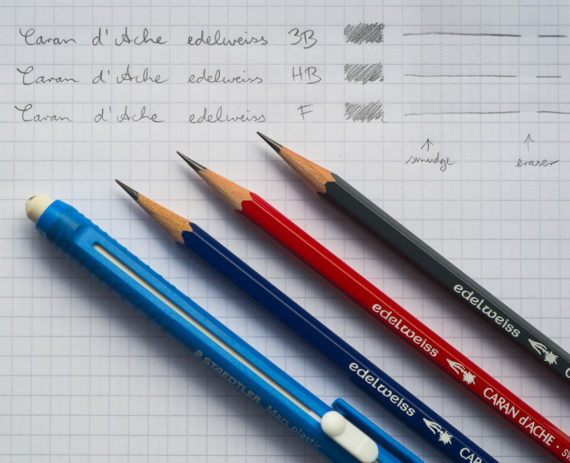 Caran d’Ache’s history goes back to 1915 when a pencil company was established that, nine years later, was bought by Arnold Schweitzer and became Caran d’Ache. The company name is linked to the Russian word for pencil – but I won’t go into more details: since you are reading pencil blogs you have probably heard this story before. I tried to find out more about the history of the edelweiss pencil but was unsuccessful as Caran d’Ache did not reply to my request for information. I do hope that it will be possible to find out more about the edelweiss and their other products in the future, as the company’s new boss Carole Hübscher is said to want to “communicate actively”, unlike her father who run the company before her and who only gave one interview in 30 years. I hope Caran d’Ache will continue to make cheap stationery but am not too optimistic about this in the long-term as their cheap products are, with a few exceptions, only available in Switzerland and even there it’s easy to find stationery shops that don’t stock Caran d’Ache pencils but those from other manufacturers. The future of Caran d’Ache and its 300 employees seems to be with high end writing instruments and boutiques like the one opened recently in Geneva. The edelweiss pencils are nice writers, but definitely less smooth than Staedtler Mars Lumograph pencils of the same grade (F, HB, 3B). Ghosting/graphite transfer between pages is good, comparable to other European pencils, with the edelweiss HB maybe performing a little bit better than Mars Lumograph of the same grade, but the F and 3B edelweiss performing a bit worse than the Mars Lumographs of the same grade. Personally, I’m partial to F pencils as they tend to keep their point for a long time without their marks being too light on paper, so I like to use them for writing in situations when sharpening a pencil too often would be odd, or when I write in a book or diary2. The paintwork and print are well done with only minor issues of chipped off paint near the unfinished cap. The current version has a black barcode printed on the pencil. The wood seems to be cedar and the pencils are easy to sharpen. 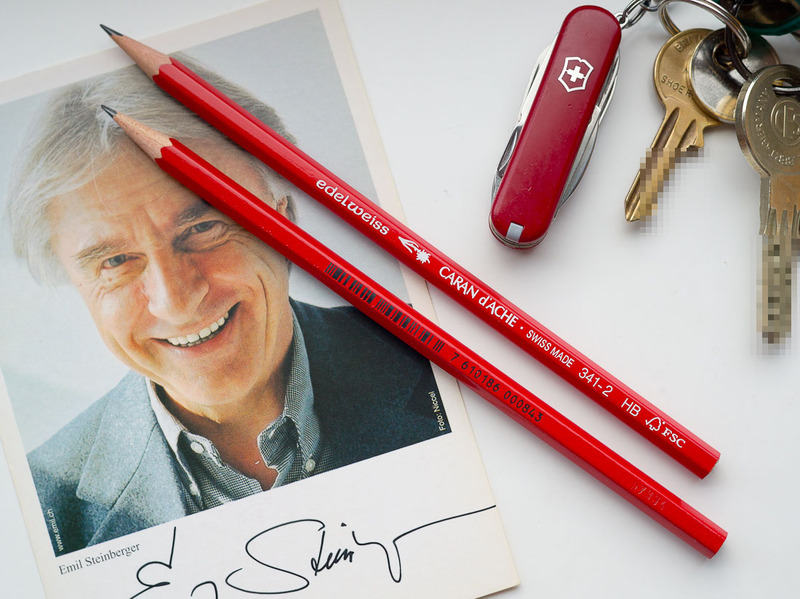 The edelweiss provides very good value for money – if you can get your hands on this pencil that is rather rare outside Switzerland. I bought these pencils in November 2011 from Stilus BSA for € 0.60 each. The price has not changed since then (September 2012). You can find a review of the edelweiss at pencil talk and a blog post at Lung sketching Scrolls. Brand name pencils has a photo of the old version of the edelweiss.